We've had a month full of unexpected and awesome surprises. We all need these times once in awhile and I always remember Who sends them! In this case, our many surprises even came with a cherry on top. Last fall we planted a cherry tree and everyone said, "You won't get anything on it for at least 3-4 years." Well, God knew we didn't have 3-4 years because we are selling our home—our dream home that we worked very hard on for the past three years—in order to pursue some even better God-dreams. I know it sounds trivial, but I was a little upset about never getting to eat our own cherries that we thought we were planting for ourselves (all of these plans God has for us happened into our lives sort of unexpectedly). Apparently God cared about my trivial because 4 miraculous cups of cherries later in the first growing season, we had our first (and last) Ferwerda-cherry-on-top cherry pie! Thank you, Lord! 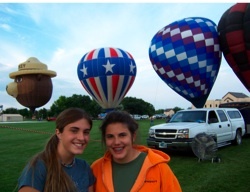 Then, last Friday we went with our girls to the annual Hot Air Balloon Rally here in the wild west (it always makes Shucks get a little goofy). It's a Ferwerda tradition and we've been going for at least 9 or 10 years. We get up at the crack of dawn…okay 6:30, close enough. And then we head to the inflation headquarters to watch the big event. This year we decided to be nice and see if some people needed help getting their balloon inflated. 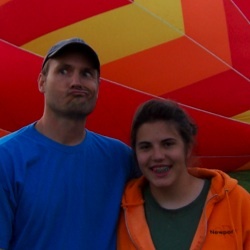 Meanwhile, 23+ balloons inflated around us, an awesome site if you've never seen it before. Before you know it, you have this amazing, enveloping canopy of color overhead. Side note: My favorite balloon is always Smokey Bear (pictured). He comes around every year, followed by his entourage of chasers who just happen to be fire trucks. 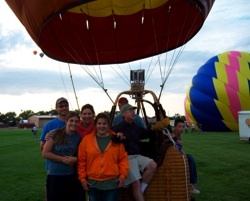 Then, to our surprise, these awesome folks from Cheyenne, 2-Tall, Roxie, and Dan, asked if we all wanted a ride! I never imagined I'd get an opportunity like that. First Dani & Jessi went, then it was our turn. We soared so high my stomach felt quivery the whole time. My brilliant 4.0 student admitted to me later that she made one of her famous ditzy remarks to the pilot while air-born, "It feels like we're floating!" She takes after me, at least in the ditzy category. Truly though, when you're being carried on the wind, it seems surreal because it's so still and quiet. Anyhow, we landed in some cow pasture a couple miles from town and had to figure out how to get our chaser truck out to us in the middle of the cow patties, but after taking out a fence or two and driving over a couple ditches, the driver made it happen. We're Wyoming folk—used to figuring out impossible situations. After we got out of the pasture, the nice balloon people dropped us at home and performed this really cool initiation ceremony on our front lawn. They had us kneel down on this special balloon quilt and toasted us with water (they usually use wine but we don't drink), and they said a prayer over us thanking God for "His gentle hands setting us safely back on earth," and then we had to down the water using only our teeth on the cups (no hands). While we did this, they snuck up and poured cold water over our heads (it's a Wyoming thing). It was all very funny but actually felt good in our scorching 9:00 a.m. heat of 85+ degrees. The whole morning was sweeeeet. We all knew it was a very unusual gift, given to us by God as a special family memory before our house parting. Lastly, God brought us another gift by providing a rental home in the town we are moving to. This town is very tight on rentals but we had a friend who knew a couple who is going to China for a year to teach English who just happened to need someone to stay in their home and take care of things. 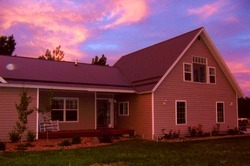 They have a bright, open, beautiful home in a mountain valley with lots of windows and many beyond comfortable amenities. So much for roughing it like we thought might happen after selling our home! I must say, when God asks you to give up something, He sure is gentle about the transition of it all (in my experience). I guess we'll have to save the hut experience for next year.